In this series of two articles, unseen for almost fifty years, Rudhyar takes a fresh look at the Zodiac, with special emphasis on the Four Elements and the Three Modes. One of the main factors which makes it difficult for a modern mind, having developed under the influence of contemporary philosophies and psychologies, to accept astrology is the astrologer's reliance upon archaic traditions and his use of a technical language equally based on an archaic approach to the world and its problems. Archaeologists pursue a very valuable activity in reconstituting from the few remaining records of the past the general outlines of the culture, the institutions and the science of ancient China, India, Egypt or Chaldea, provided that their conclusions are not based on the study of only a limited section of the culture being studied — which does often happen! However, we are living today. The fundamental concern of astrologers should be with the existing problems and personal attitudes of men and women who are now asking questions and seeking solutions in terms of the concepts and emotional drives which modern society has produced. Each civilization has its basic way of meeting the various problems it faces. In the ancient past, astrology was an essential component in man's attempts to solve his physical uncertainties and his psychological anxieties concerning the future. It was a fundamental technique for the discovery of the order and periodicity which we realize to be inherent in the sequence of our experiences when we take a really objective attitude toward them. The manifestation in the future of what is periodic can be predicted, and what can be classified can be given a well-defined place in our environment and a precise name. Knowing where anything "belongs" and what it is called produces a sense of security and the feeling that somehow we can control events. However, it is becoming increasingly clear in some modern sciences — particularly the ones which deal with human beings, their welfare and their ills (physical or psychological) — that by stressing the exact place of and giving precise names to what happens, we may also lose contact with the deepest realities of existence. Existence is seen more and more as a process — thus, as a series of more or less exactly "cyclic" transformations. We realize that what is most important is the process-as-a-whole, not the separate events to which we gave set characteristics. To consider what happens at a particular time as an "entity" with a name inevitably emphasizes its separation from other entities; whereas if we think of any event and phenomenon — or even of any person, race or society — as a phase of some vast process, we gain a new perspective on life — a truly "modern" outlook. The type of astrology almost everywhere in use today is based on set classifications and on traditional technical names. Each sign or house is given a variety of more or less precise features or characteristics. It stands as an entity to which, in most cases, a moral signification (good or bad, fortunate or unfortunate) is attributed. Likewise, an "aspect" — such as a square — has a definite character simply because it reveals that two astrological factors (celestial bodies or symbolic points) make a 90° angle to each other. According to this purely abstract concept of "aspect," a square of the Moon and the Sun has a meaning which applies equally well to two different "existential situations" (i.e,. to two actual human experiences) called First Quarter and Last Quarter of the Moon. A square aspect between the Sun and Moon is, however (from the modern point of view), only a phase in the cyclic process defined by the related cyclic movements of the (apparent) Sun and Moon — a process which begins at the conjunction (New Moon) and reaches an apex in the opposition (Full Moon). The square aspect following the New Moon (First Quarter) cannot logically have the same meaning — in terms of the cycle as a whole — as the square which belongs to the waning hemicycle of the lunation cycle (Last Quarter). This applies as well to any aspect between two moving celestial bodies. 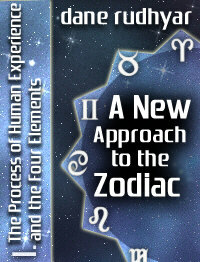 From this same "modern" point of view, the zodiac represents also a process. It should be referred to the basic human experience of the seasons and applied to all that is affected by the seasonal rhythm of the year. Indeed, it seems very likely that the zodiac was originally a seasonal cycle, a time factor. Only later in the classical cultures of India, Egypt, Babylon (three or four millennia ago) did it become a spatial pattern, a geometric and figurative method of dividing the sky for the purpose of mapping more exactly the movements of the planets. Such a transformation would parallel quite exactly that of music, for music originally was based on series of tones and rhythms; only in "classical" periods, and particularly in Greece, did intervals (and "notes," as abstract components of the scales or series of intervals) become fundamental elements of a music in which, after a while, notation and the score which could be read emphasized further the "spatial" or geometric factor. Music is emerging today — thanks to tape recorders and electronic devices — into a new world of unbound possibilities, by stressing the primary factor of sound, the direct experience of tone and rhythm — by replacing spatial patterns on printed scores by durational processes of tone transformation. This is a key to the modern world we are entering into; and it can — indeed, I believe it should be — applied to astrology, by reasserting the sense of process and flow of experience and by transforming not only our approach to the zodiac, but our entire picture of the solar system and the universe as well. We are not living in ancient India or Babylon. We are living today — and the rigid doctrines and rationalisms of the past have been discredited and proven unable to solve the problems of our present-day existence. Yes, in a sense, ours is a "primitive" age. It is so in the sense that we must reassert the primacy of human existence and the immediacy of our experience of life — life, with its many phases and its various levels of activity. Aries, Cancer, Libra, Capricorn considered as signs of the zodiac are names given by our civilization to certain basic turning points or phases in the cycle of seasonal changes which affects the rhythm of all that lives on the earth surface. These changes are factual, existential, emotional — thus, real. They do not depend on celestial maps drawn by priests or intellectuals, stargazers or astronomers. You and I live them. Modern civilization tends to blur the sharpness of the seasonal changes, making available heat and tropical fruits in winter, and so on. Yet under the varnish of a possibly dying civilization, the "fundamental nature" of man cannot be suppressed. Denying it, men turn neurotic, insane, criminals — or are "safely" depersonalized into robots. The value of the experience of seasonal change is basic for man. Greatly creative cultures seem to have developed mostly where this change was deeply marked, yet not so severe as to produce the extreme phase called hibernation. In some cases, the change was most marked as an alternation of wet and dry weather; but in any case, the great symbol of the yearly process has been the change made visible by vegetation with its two fundamental modes of existence — the plant state (characterized especially by the leaf, modified into flower for fecundative purposes) and the seed state. The zodiac as a seasonal process is symbolized by these two conditions of existence in yearly alternation. The plant state reveals its fullness when the days are longest (Cancer); the seed state experiences its mysterious moment of inner transformation, represented in our culture by Christ-birth, when the nights are longest (Capricorn). This yearly rhythm of alternation became obviously connected with the changes in the Sun's elevation in the sky, particularly with the changing places, through the year, of the Sun's setting. Stone pillars were erected in the most ancient past to mark the places at which the Sun sets at regular intervals during the year, and this seems to have been the first zodiac — a fact of human experience relating the Sun to the earth horizon. What we call Aries is the phase of the yearly cycle of this Sun-earth relationship at which the Sun sets exactly at the west before the setting point begins to creep slowly northward — Libra, the phase at which the Sun also sets exactly west — but thereafter sets more and more southward. These are the equinoctial moments of the yearly process. The extreme places of setting north and south are, respectively, Cancer and Capricorn — the two solsticial cultures which actually are rooted in the soil of the southern hemisphere. According to our astrological traditions which differ in other civilizations, like the ancient Chinese, these four fundamental phases of the seasonal process — and, thus, of the earth-to-Sun relationship — are symbolized by the four "elements": fire, water, air and earth. Fire and air are equinoctial; they mark situations of day-night equilibrium and of intense momentum of change in the seasonal cycle. Fire starts the seed germinating and ends, thus, the seed state; air releases the seed from the seasonal plant which, as this happens, begins to die. These astrological, as well as chemical elements are often only superficially understood. The names they carry are obvious "blinds," as we can well see from alchemical traditions; and the connection between alchemy and astrology (and also religious rites and musical modes) has been shown clearly at various times, particularly in the Syria of the days of the Crusades. These four elements constitute the basic quaternary which is the structural factor in all cyclic manifestations: and it can be related to the Hebrew Tetragrammaton, the sacred four-letter names of God, J H V H (Jod, He, Van, He). The first letter refers to the animating principle, fire. Fire consumes or tears open all that is the seed results of the past; it is the divine will to renewal which makes whatever had until then manifested past and obsolete as a concrete form. The third letter of the sacred name (the Vau) represents the element air. Air is the unifying factor in life; it balances the differentiating power, fire. Water (the first He letter) and earth (the second He letter) refer to the types of pressures that change intensely dynamic urges into static accomplishments. In a sense, these two elements have the same character; but they operate upon two forces of opposite polarities, fire and air. Fire plus water produces individual living organisms which cry out their individuality in midsummer; air plus earth produces collective social organizations which propagate their achievements (while glorying in them) in midwinter. The spring phases of the seasonal cycle (Aries, Taurus, Gemini) particularize the universal; the autumn phases generalize the particular. Water triumphs in the particular organism that has isolated itself from other organisms (Cancer, the home, the individual ego-centered person). Earth triumphs in generally accepted, held valid and obeyed "institutions" — at the limit, the State (Capricorn) — within which individuals find themselves integrated. In the second part of this brief study, the character of each of the four elements will be analyzed in greater detail; but it must be said at once that each element has its primary manifestation in three zodiacs. There are three zodiacs because while the process of human existence is one, it operates at three levels. Each level has its reflections or anticipations upon the other; thus, the fourfold character of each zodiac expands into a twelvefold (three times four) pattern. These three levels refer to (1) Life, as a cosmic power generating periodically new forms; (2) Personality and the development of the ego or "I am" feeling; (3) Mentality, this word being understood as the correlated activity of a group of individuals who together are building complex patterns of thought (for instance, a culture as a whole, "science" as an integrated system of classification and interpretation of natural phenomena and human experiences). The first zodiac begins with Aries; the second, with Leo; the third, with Sagittarius. Each, I repeat, represents a process which can be defined by a periodical sequence of four basic phases which are given the symbolical names of fire, water, air and earth. It is the constant interaction of these three processes at three levels which constitutes what we call "human existence." "Man" is that complex being in whom these three processes are integrated. The integration may be consonant or dissonant. It may emphasize one process and one level at the expense of the others. The possibilities of combinations are almost infinite when one considers how each phase of each process and its subdivisions can be activated in one way or another by the cyclic interactions of the planetary movements. Each combination establishes the "seed pattern" of a particular form of individuality, and it indicates (through its extension as "progressions" and "transits") the natural unfoldment of its innate potential (1) as a living organism, (2) as a personality and (3) as a participant in the mental activity of a community or of mankind as a whole.